I love my job. How many people get to wake up on a Wednesday morning in July, pile into a minivan completely decked out in a Twizzler candy wrap, and just start driving? Today, we began Trekaroo’s leg of the Twizzlers Landmark Summer Adventure with smiles on our faces and a box full of Twizzlers in our trunk. 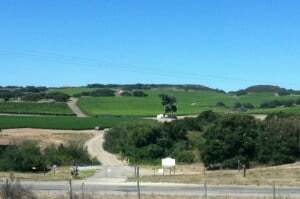 After making it through Los Angeles with only a scant few stop and go moments, my husband and I breathed collective sighs of relief and watched the coastal towns on Highway 101 whizz by. After three or so hours of driving, I decided to pull off the road at the famous Pea Soup Andersens restaurant to get a fun picture of the Twizzlermobile in front of the iconic roadside stop and stretch our legs a bit. Obviously, I was not paying close enough attention to the numerous split pea themed signs because suddenly we found ourselves leaving Buellton and entering Solvang. My navigation skills turned out to be a blessing in disguise. 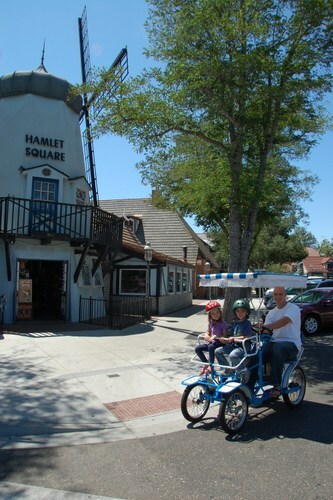 The last time I visited Solvang, a charming Dutch town on California’s central coast, my kids were less than a year old so everything in this Danish hamlet felt new to them. 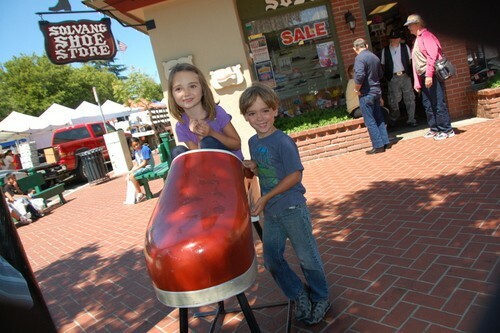 We decided to take a surrey ride around the town, which my kids absolutely loved, and stopped to grab grapes from the farmer’s market and pose in front of the same wooden shoe I posed my infants in years ago. 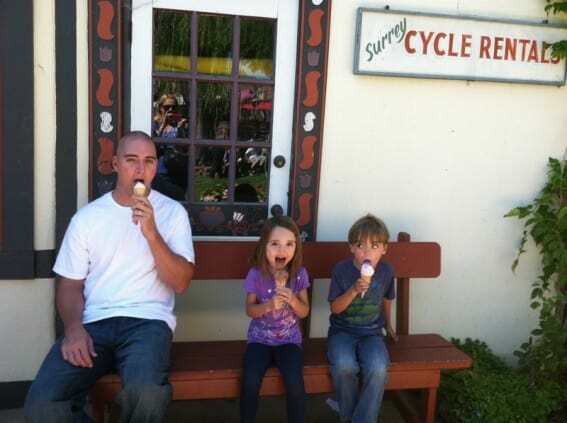 After enjoying ice cream in the town square and letting the kids point out to Mommy and Daddy all the toys they “needed” from the local toy shoppe, we hopped back on the highway, waving to Anderson’s Pea Soup just on the other side of the road. As we drove further along up the Central California coast, I marveled at how many new wineries had popped up in recent years and made a mental note to visit at least one on our trip back down from San Francisco. 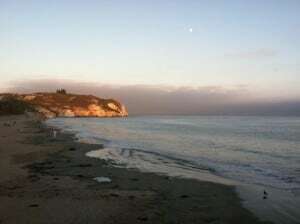 We ended our day at the Lighthouse Suites in Avila Beach. I had never been to Avila Beach, the little sister of the much more popular Pismo Beach, but now that I have had the opportunity to get to know this tiny beach town, I have already made a mental note to return next summer. Lighthouse Suites, our lodging for the night, is definitely a property designed with families in mind. All the rooms are suite-sized with separate living and bedroom areas. The decor is charmingly nautical, celebrating the hotel’s beachside location and expansive ocean views. Families will love the heated pool, spa, life sized checker board, ping pong table, putting green, and complimentary breakfast. Directly across the street, a pirate ship themed park sits next to the Avila Beach Sea Life Center. 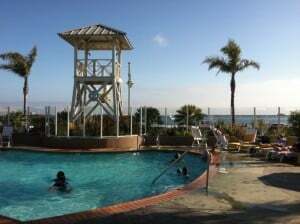 The beach is located about 20 steps from the hotel with soft sand, gentle waves, and two piers flanking it on either side. 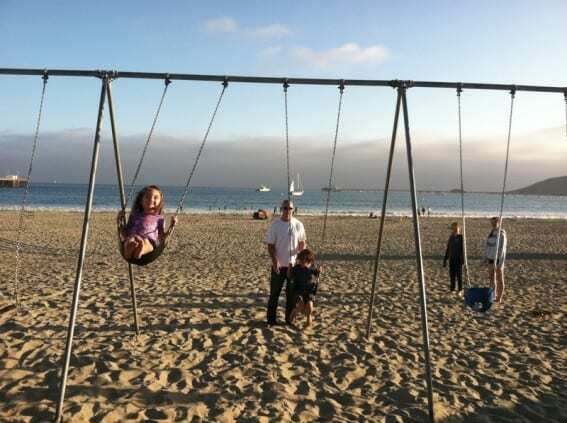 A set of swings and a slide sit on the beach as well. 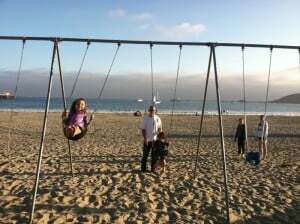 After enjoying the pool, playground, and beach my family made our way to the Avila Pier. 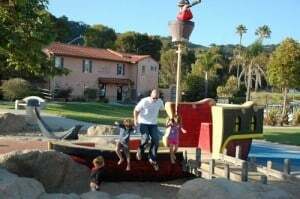 We strolled on its wide planks while waiting for a table at the Custom House, a popular local eatery serving seafood, steaks, and kid’s meals delivered on frisbees which my children were absolutely delighted to take back home. While on the pier, we watched pelicans dive bomb the ocean in search of fish, usually with two scavenger birds flanking it’s sides in hopes of grabbing some of the pelican’s hard-earned prize. 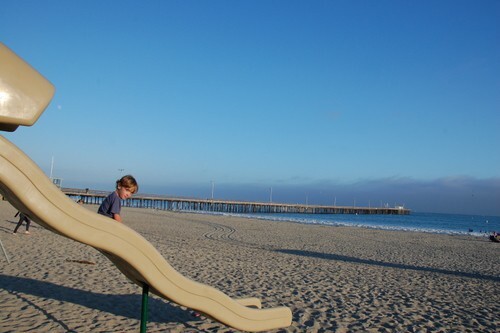 As the sun began to set, my daughter noticed a sea otter feeding in the kelp beds below the pier. Upon further scanning on the water, we found several little otters bobbing in the water. I can’t wait to see what unexpected moments we have in store for us tomorrow! I want to see pictures of the Twizzlermobile! Shar, you get to do the coolest things! where’s the pic of the decked-out Twizzler mobile???? Sounds like a fun first day… And much more relaxing than the first day of the Race to the Alamo! 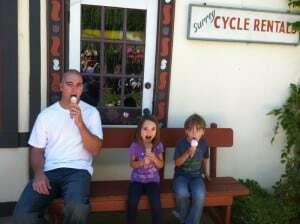 Glad you are enjoying Avila Beach. It was one my favs from childhood.